Originally published in The Otter June 23, 2014. On the last weekend in April 2014 NiCHE Prairie Environmental Network (PEN) workshop convened to share research and network with other scholars working on environmental history. While PEN is primarily focused on prairie topics it also welcomed environmental scholars living in the prairies but working on topics outside of the region. The workshop opened with a round of lightning presentations from several graduate students. These three-minute presentations allowed PEN participants to hear about these projects in their initial stages. The topics ranged from First Nations land use to how environmental conditions affected British army nursing practices. Alwynne Beaudoin of the Royal Alberta Museum (RAM) then spoke on bison movement patterns. The presentation focused on discerning a bison landscape in the paleoecological record where bison did not migrate but moved through their world in search of their own ideal environments. Beaudoin also showed photos of a recently discovered bison skull from Cold Lake, Alberta, which is the largest skull in the RAM’s collection. George Colpitts from the University of Calgary showcased a project on a rabies outbreak in Alberta that occurred in the 1950s in which he discussed how the idea of rabies as being spread by wild / untamed nature played into the response to the outbreak. Colpitts noted that medical and veterinary science was used extensively in official communications about the outbreak. One consequence of the rabies outbreak was the introduction of leashing laws for domestic dogs in Banff and Jasper which changed the towns’ ecologies. The following presentation, which hit on a lighter note, came from University of Saskatchewan PhD candidate Matt Todd, who showed how Star Trek explored typical progressive and declensionist narratives in frontier settings including the conflict between resource extraction and the original inhabitants where frontiers needed to be “civilized” but were also seen as pristine. A short coffee break allowed participants the chance to continue their questions from the previous sessions before Geoff Cunfer, Alec Aitken, and Jessica DeWitt from the University of Saskatchewan showcased their own projects. Cunfer, from the University of Saskatchewan’s Department of History, presented an overview of the Sustainable Farm Systems project which is an international collaboration between groups in Europe, North America, Cuba, and South America with future hopes to bring the project to other regions. The project examines past agricultural practices using a variety of methods that rest on a socioecological metabolism framework. These methods are used to understand energy and nutrient inputs and exports in an agro-ecological system at a local and regional level. Understanding these transitions and how energy balances change with the move to fossil fuels provides new perspectives on present agriculture activities. Shifting from the near past to the distant past Alec Aitken from the University of Saskatchewan’s Department of Geography and Planning provided the workshop with an overview of the archeological work he is involved in around Saskatoon with particular emphasis on investigating early human habitation. He pointed out the challenges of doing archeological explorations in areas close to the river and how past changes in the climate are reflected in the landscape. One problem created by changing environments are losses when lakes dry up and erase the “archive” of the archeological record. History Department PhD candidate Jessica DeWitt returned the group to the present as she explored how understandings of what is natural shaped the creation and development of two parks. Both Ontario’s Bronte Creek Provincial Park and Pennsylvania’s Point State Park are in urbanized areas but DeWitt argues they were created to showcase a particular understanding of what a “natural” park should be. Marley Waiser, a retired Environment Canada scientist, closed the afternoon with a presentation about her past research on the ecosystem of Wascana Creek, SK which is located by Regina. The waste treatment facilities of the city empty into the creek which Waiser and her team found created significant changes in the creek’s conditions including increases in the levels of chemicals associated with pharmaceuticals and personal care products (PPCPs) which in turn affected the composition of flora and fauna in the creek. Throughout the presentation she explained the scientific methods behind collecting the data including one instance where her team had to improvise equipment to study a particular aspect of water quality. Waiser also noted that downstream from the waste treatment facilities there was an increase in nitrogen and phosphorous. The final day of the workshop was a field trip to the Wanuskewin Heritage Park located just outside of Saskatoon. 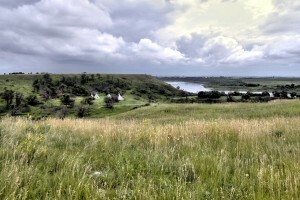 As they approached, participants had an unobstructed view of the Wanuskewin building which stands at the top of a high bank so that visitors to the site can look across to see the drop-off that was used as a buffalo jump. Ernie Walker, from the University of Saskatchewan, gave a tour of the facility and explained the long process of turning the land, which had been owned by a rancher who wanted to see it cared for after his passing, into the present day park and the plans for how the park will continue to be used in the future. He noted that from the beginning there had been a particular emphasis on partnership with local First Nations, whose history is intertwined with the site, to make sure that Wanuskewin respects their traditions and reflects their needs. After two days of the NiCHE Prairie Environmental Network workshop it was clear that although the participants had very diverse interests there was a common thread around the interaction between people and their environments. Additionally the workshop provided a forum for cross-fertilization based on participants seeing other methodological approaches to environmental topics which they could find useful for their own work. Participants were interested not just in examining the environment of the past, but in how their research could be used to examine lessons for human-environment interactions which resonate in the present and future.